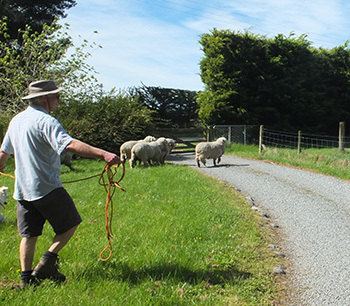 It would have been easier to trust to the sheep's long-term memories, which must run something like this : 'Off we go, down the road, down the road some more, down the road some more.' Hmm... Would you trust a sheep to remember anything? Anyway, it's shearing time, and I've been helping in the shed. My tasks have been to collect and clean-up the crutchings, keep the shearer's board clean, sweep the floors, and pack away the belly fleeces. Five hours later I'm home, covered in lanolin, smelling rather nice. Our fleece-less ewes are back with their lambs, and the boys are out the back, looking rather disreputable. A merino ram's natural shape underneath all that wool is not so elegant. It's also difficult with wrinkled necks and curly horns not to get a few minor cuts. +24 But just imagine how liberating it must feel to lose all that heavy wool! And how annoying it must be not to be able to take your coat off. Sheep may not be renowned for their thinking ability, but I'm sure they have feelings... Mike the shearer, shins successfully kicked three times by Charles the senior ram, may not agree with me.